If you would have asked me a few years ago if I would have been caught wearing leopard print pants (regularly) I would have laughed at you. Seriously! I am a walking contradiction. I will proclaim I will never wear something and then as soon as I find it in the perfect style (for me) I then try the trend. In some cases this takes years! Items I have said I would never wear and then within the past four years have worn? Print pants, hot pants, harem pants, gladiator sandals, post giving birth body con dress, post giving birth mini skirt, sneaker wedges, braless dresses, and the big one, flats. But I digress. I got these leopard print pants last summer and have worn them three times since. 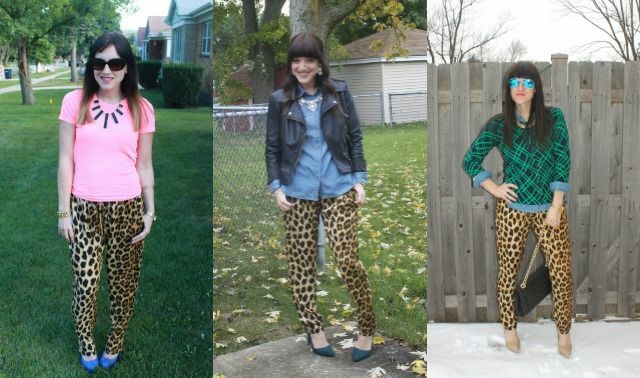 I never thought a leopard pant would be thing I really enjoy wearing, but I do! Do you like how I have styled my pants so far? What are some trends you swore you'd never wear and have ended up loving? I really like the first one a lot! I always swore I would never wear flats and now I wear them all the time! haha!